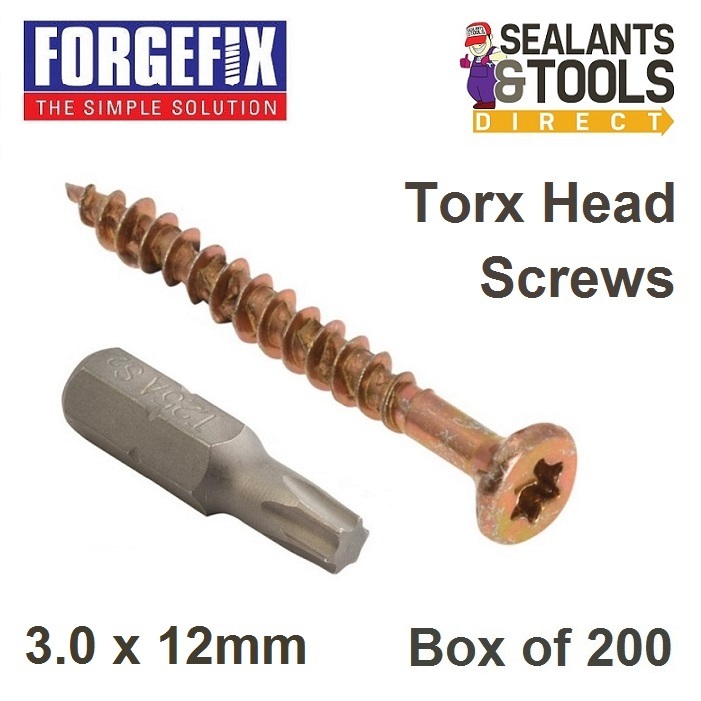 Excellent quality 12mm general purpose torx headed Multi Purpose Wood screws, super sharp points give an immediate bite and the unique single thread spiral shank enables them to drive in with ease. The Torx head prevents cam out once you have used these you wont want to use a different headed screw again. Forgefix Torx Compatible Elite Woodscrews suitable for many materials including PVCu, timber, chipboard, fiberglass and MDF. Elementech 400 surface coating provides corrosion resistance Salt spray tested to 400 hours. Hardened case and core for exceptional strength, and are CE approved for load bearing timber construction. A 35° bending angle prevents the screw shearing when the timber flexes with use. Zinc yellow passivated for increased corrosion resistance. Hardened case and core for exceptional strength. Each box contains the appropriate torx bit. See the full range of screws and fixings. You may also like to visit the Forgefix web site for more information.